I’ve finally got some really great Animation and Commercial voiceover demos up! I’ve had great training with some of the best teachers in LA, along with solid Method Acting training and creds and a really wide range of voices and capability. If you’ve got about three minutes, please give them a listen and maybe you’ll remember me when something comes up? Thank you so much for any consideration and time. 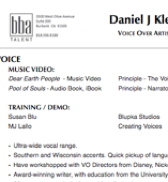 If you&apos;d like to schedule an audition, give Mike O&apos;Dell a jingle over at BBA Talent in Los Angeles. Just click on the BBA logo link above. • VoiceOver credits and training with Susan Blu, MJ Lallo, VO Directors from Disney, Nickelodeon, and various agencies. • Trained Method Actor with Laurie and Dianne Hull. Credits include an Emmy-winning PSA. • 25 years as an award-winning multimedia business owner - design, photography, creative direction, performing musician, etc. • Award-winning writer, with education from the University of Iowa Writers Workshop.